The U.S. Environmental Protection Agency took action on an Advanced Notice of Proposed Rulemaking (ANPR) yesterday and are now seeking public input on the effectiveness of current water quality programs influencing the health of the San Francisco Bay Delta Estuary. The ANPR identifies pivotal water quality issues affecting Bay Delta fisheries, describes regulatory measures currently underway, and initiates an information-gathering process on how the EPA and the State of California can achieve water quality and aquatic resource protection goals in one of the West Coast's most ecologically diverse and important aquatic habitats. The Bay Delta is the hub of California's water distribution system, providing drinking water to 25 million people, sustaining irrigation for 4 million acres of farmland, and supporting 750 different species of plants, fish, and wildlife, several of which are endangered or threatened. The water quality of the Bay Delta Estuary and many of its tributaries is impaired, the estuarine habitat is shrinking and many fish populations are at all-time lows. "The Bay Delta is a major source of our tap water and the water used to grow our food," said Jared Blumenfeld, EPA's Regional Administrator for the Pacific Southwest. "EPA is committed to tackling the pollution degrading the Delta, which is threatened by contaminants from sewage, pesticides, and a host of other chemicals." No single factor is responsible for the decline of the Bay Delta's health. The present condition of the estuary reflects the cumulative and interactive effects of multiple factors, including water pollution, invasive species, water diversion and habitat degradation. Impacts associated with these stressors include toxicity to fish, invertebrates and their food sources, developmental deformities, and reproductive problems. This ANPR is part of a comprehensive set of commitments made by the Obama Administration to address California water issues under the Interim Federal Action Plan released in December 2009. Through this plan, the Administration has promoted water conservation and efficiency improvements throughout California, dedicated more than $40 million to drought relief projects, and made historic investments in modernizing California's water infrastructure. "Communities rely on their water resources to supply clean water, sustain their environment, and support vital economic activities," said Nancy Sutley, Chair of the White House Council on Environmental Quality. "Identifying the water quality challenges in the Bay Delta is key to addressing the delta's complex and long-standing water problems and ensuring healthy communities and economies in California." In its ANPR, EPA notes that it will be coordinating its review of water quality issues with the on-going development of the Bay Delta Conservation Plan, which currently is being developed through a collaboration of federal, state and local agencies, environmental organizations, and other interested parties. Deputy Secretary of the Interior, David J. Hayes, who has been helping to lead the BDCP effort for the federal agencies, welcomed EPA's action, noting that "EPA's attention to a variety of water quality stressors and the role they play is an important complement to the science-based analysis that is going into the Bay Delta Conservation Plan effort." He continued: "The Administration is committed to working together across our agencies to use the best science to meet the twin goals that California has adopted for the Bay Delta in its comprehensive new water legislation: a more reliable water supply and a restored and enhanced ecosystem - including improved water quality." In addition to protecting aquatic species' habitat, the federal Clean Water Act charges EPA with protecting water quality for a variety of uses that are not addressed in this ANPR, including water for drinking and agriculture. Water quality standards are established under the Clean Water Act to protect public health, welfare, and the protection and propagation of fish, shell fish, and wildlife. The ANPR identifies specific issues for which the EPA has regulatory responsibility and solicits comment on topics, such as potential site-specific water quality standards and site-specific changes to pesticide regulation. Summaries describing environmental stressors and the regulatory framework necessary to address them are also included in the ANPR. California's State and Regional Water Boards have the lead role under the federal Clean Water Act to protect water quality; they are actively engaged in multiple efforts, including establishing numeric water quality criteria and developing and implementing watershed improvement plans. The recovery of the Bay Delta reflects national efforts to ensure higher water quality, protect public health, and support essential fish, shell fish, and wildlife populations. The EPA, in collaboration with the State Water Resource Control Board and the Regional Water Quality Control Board, seeks to protect the biological, physical, and chemical integrity of the Bay Delta and its aquatic resources. Public input and scientific findings obtained from the ANPR will be reviewed and used to develop a strategic proposal for future EPA efforts toward protecting the Bay Delta and other important waterways. 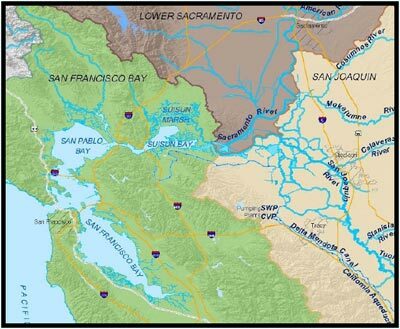 The ANPR solicits public input on how EPA and the State of California can achieve water quality and aquatic resource protection goals in the Bay Delta Estuary and how to best use Clean Water Act programs to improve Delta water quality. No new rules are proposed in the ANPR and the ANPR has no regulatory effect. The ANPR will be published to the Federal Register within one week. EPA encourages interested parties to read the ANPR and provide additional information and suggestions for actions to improve Bay Delta Estuary water quality and aquatic resource protection. Comments can be submitted electronically at the Federal Rulemaking Portal (www.regulations.gov) identified by docket EPA-R09-OW-210-0976 or in hardcopy addressed to Erin Foresman, US Environmental Protection Agency, 75 Hawthorne Street, San Francisco, CA 94105.